Fill a large bowl with cold water and add the sugar and salt. Stir, then add the shrimp and let them sit in the brine for about 30 minutes. Drain. Combine the oregano, smoked paprika, thyme, ancho chile powder, and salt in a large bowl. Add the shrimp and olive oil and stir until all of the shrimp are coated in the oil and spice mixture. Let sit for 10 to 15 minutes. Melt the butter in a small sauce pan until melted and just beginning to sizzle. Add the garlic, stir, and turn off the heat. 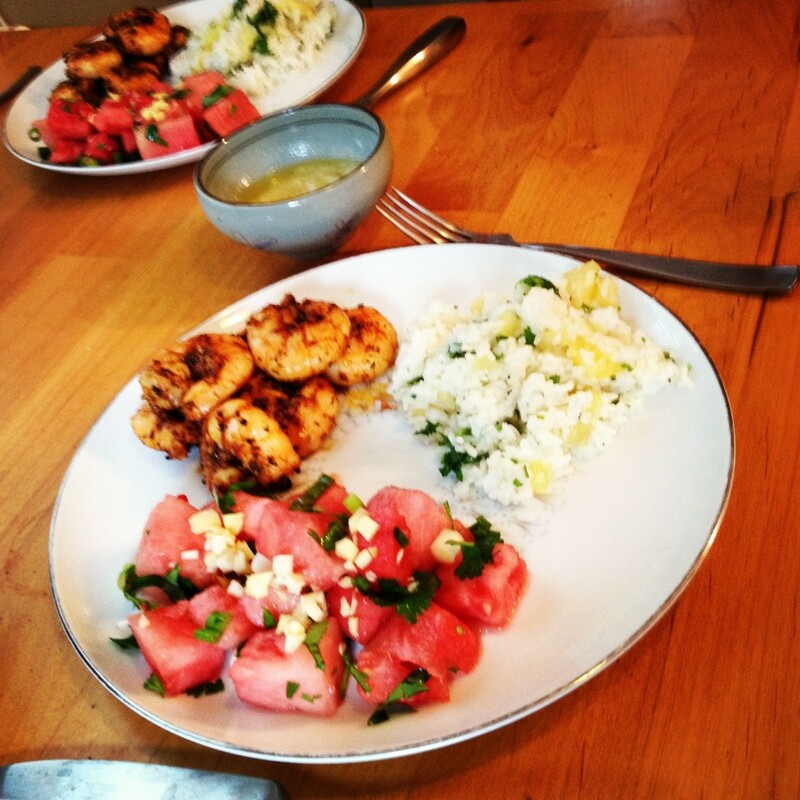 Cook the shrimp on a very hot grill for 4 to 5 minutes, until seared on the outside and fully pink. 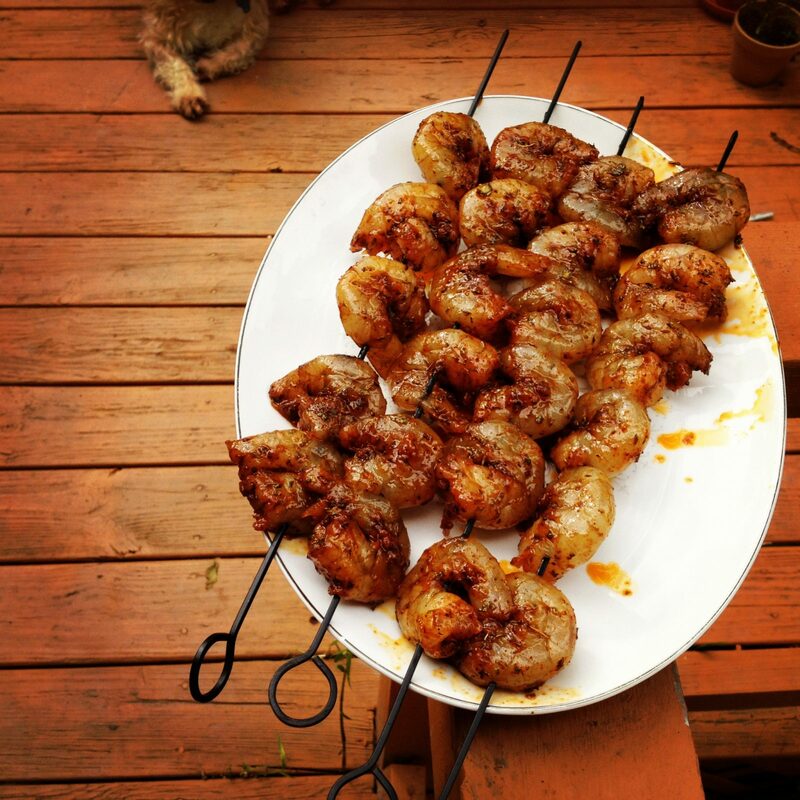 If using a grill basket, toss once or twice to get the shrimp evenly seared. If using skewers, flip once while cooking. Serve with the garlic butter (and good bread) for dipping. Make the dressing: Heat the vinegar in the microwave for 15 secs to warm it. Dissolve the sugar in the vinegar and refrigerate. In a bowl, combine the sugar with the vinegar, lime juice, ginger, garlic, and salt. Whisk vigorously until well combined. Add basil, cilantro, scallions, chile, and sesame seeds. Season with salt and pepper to taste. 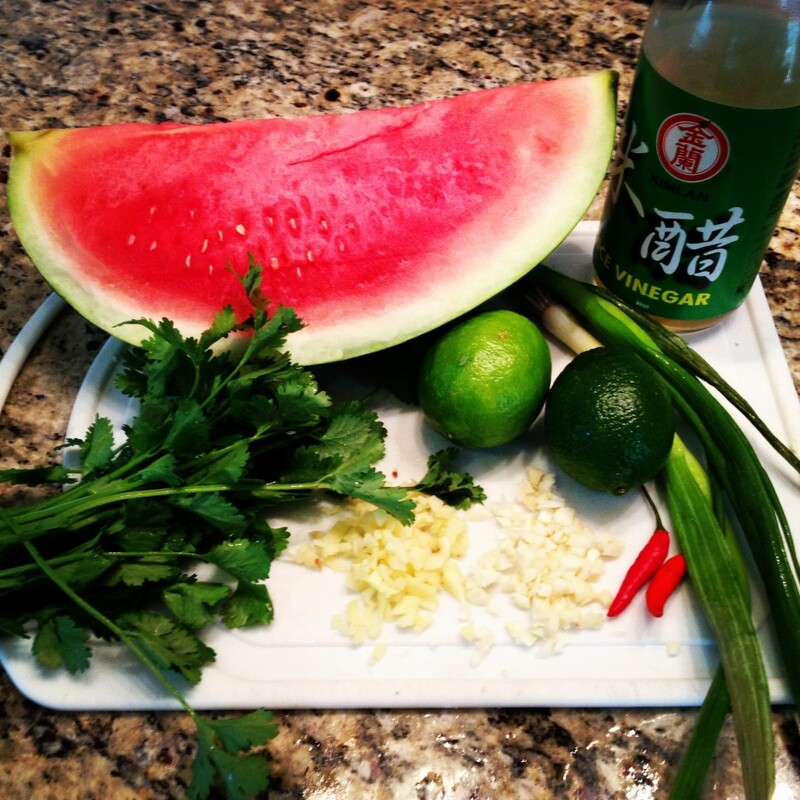 In a mixing bowl, toss the chilled watermelon flesh with enough dressing to coat the watermelon. Drizzle additional dressing around the plate. Serve immediately.